Britain's "leakiest" water supplier Thames Water has announced plans to build a £1bn reservoir to meet increased water demand. Thames said the site near Abingdon, Oxfordshire, would be the biggest built in the UK in 25 years, holding 150 billion litres of water. The plan - which could force some people to move home - would mean customers paying more for their water. Water watchdog Ofwat has described Thames as the UK's leakiest supplier. Supply source: 83% surface, 17% ground. The reservoir, planned for farmland near Abingdon, would supply an extra 350 million litres of water a day, the majority of which is needed in London. Despite its size - it would hold about half the volume of water of Lake Windermere - the amount falls far short of the estimated 900 million litres a day being lost through leaky pipes under the streets of the capital. The company said customer demand was also expected to rocket over the next three decades, on top of a predicted population increase of 800,000 for London in the next ten years, and forecasts of hotter and drier summers. The plan meant customers would have to pay higher prices, or otherwise face an increased risk in hosepipe bans and water restrictions, it said. People living between the villages of East Hanney and Steventon would be most affected by the reservoir, with the company warning of compulsory purchase orders (CPOs) on some homes. 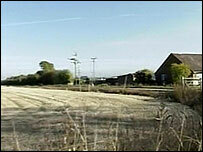 Richard Aylard, environmental director of Thames Water, said: "I have huge sympathy for the people living there. No doubt some will not want to leave. "We have spoken to the people in the area, saying if they are interested in selling, we want to buy." But he said he hoped CPOs could be avoided. A public consultation on the plans will last until November. It marks the first of three stages of consultation, looking at future demand for water and the best location for a reservoir. The second stage will concentrate on the design of the site, and the third its environmental impact. "We want to know what local people think, we want to know what kind of a reservoir they want, and we want to explain exactly why more water is needed," Mr Aylard said. "We've got to use less water, we've got to get leakage right down, but we are also going to need more water and the sensible time to store it is in the winter, when it would otherwise just run rapidly out to sea - store it in a reservoir so we can draw on it in the summer." Nick Scone of the Campaign to Protect Rural England said: "We're not necessarily against it, but our local branch does feel that the case for this reservoir is not proven and at the national level we tend to agree with that view. "There's going to be a lot of work needed by Thames Water to show that there is a case for this reservoir." Mr Scone said there needed to be proof of "social, economic and environmental" benefits. If the scheme is approved at a public inquiry, construction is likely to begin in 2011 and is due to last about eight years. The Consumer Council for Water said it welcomed the plan, but warned it was not the sole solution to the region's water resource problems. "Thames Water must continue to reduce leakage faster and further than it has in the past, and consumers must continue to use water sensibly," it said. Clickable map: Ban in your area? What happened to the drought? Water profits flowing too freely?